When my friend Jay Rayner was in town from London to promote his new book - soon to be made into a Hollywood movie - Eating Crow, we drove down to Manresa for dinner. Jay - when he is not busy being a novelist - is an influential restaurant critic for the UK Guardian/Observer. We shared some wonderful meals together, one of which - our last year pig fest at St.John in London - ranked amongst the best meals we have ever had. Prior to this trip, he had just been in New York to do a review of Per Se. So, it was not without a slight trepidation that I took him down to Los Gatos to introduce him to David Kinch and Manresa. Not that I wasn't confident of David's ability, only that, if anything at all went wrong, and he ended up writing a bad review of the place, it would just ruin all the fun for me. Another tough thing was that Jay had asked me not to tell Manresa that he was going to do a review, a request which, with some difficulty, I managed to comply. So we went to Manresa, and had yet another truly wonderful meal there - I have since had two more, simply astonishing what that David is capable of. About 2/3 of the way through the meal, Jay turned to me and said "something catastrophic would have to happen for me not to write a rave review of the place". The bell that is tolling for Bush's policies that deprive the poor, that bully the weak, that enrich the wealthy, that erode civil rights, that despoil the environment, that degrade America's morality in the prison camps of Bush's creation, that bell tolls for me. It darkens my life, restricts my liberty and depresses my pursuit of happiness. And you, can you hear it now? This latest edition of Is My Blog Burning, hosted by another SF Food Blogger Derrick of Obsession with Food, is all about terrines. Though I am very fond of terrines, I have never really made one myself. So it took me a while to decide what to make for this. First I thought I would try the famous Pâté de Campagne recipe from the famous Parisian bistro La Régalade. I even remembered to bring home some piments d'Espalette en poudre – which was called for in the recipe – from my last trip to Paris. But then I thought I really should do something different, and thought of a terrine I made for a Thai dinner party a while back. So that's what I ended up with. 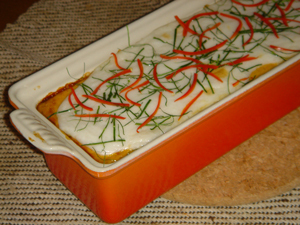 Not a Terrine in the classical sense, but Thai curry that is baked in a terrine. This is a slightly interpreted version of the classic Hor-mok, a custard-like steamed curry which is traditionally made with fish, and steamed in individual little cups made of banana leaf. Because it's a pain to find fresh banana leafs in America, not to mention trying to fashion them into little cups, I always just make mine in the pretty Le Creuset terrine. There are endless variations of the Thai Hormok, made with fish, wild mushrooms, seafood, or even minced pork. I love to make mine with whatever seafood looks good that day at the market. This time, I found beautiful day boat scallops and crabmeat at Bryan's on California St., so I decided to use them. The curry itself is made with the same basic ingredients as normal red curry, starting with curry paste and coconut milk, and some fish sauce. I add some eggs and a bit of flour to the curry paste/coconut milk mixture to help it to set into a more custard-like consistency instead of the normal soupy curry. This is also a really good recipe for a party, as you could prepare everything up to a day ahead and just bake the terrine just before dinner. It looks quite impressive, although it's actually rather easy to make, not to mention delicious on top of freshly steamed rice. The texture will be a little too loose to be a beautifully layered terrine, but the taste will not disappoint anyone. Try it and let me know what you think. There are a few new things to talk about around the San Francisco food blog circles: a new book, a new-ish blog, and another party. The new book, Cook 1.0, is by our very own Heidi, of 101 cookbooks. I was at the launch party at her house yesterday to celebrate the occasion. The book is really a lovely approach to vegetarian cooking. Heidi applied her masterful skills in visual design to create a very usable handbook for new and skilled cooks alike. The new-ish blog is A Full Belly by Alaina, previously of NYC Eats. Alaina and her partner Anil moved from The City to The Other City a few months back, and Alaina finally revamped her blog to now include food happenings and interests in the Bay Area as well. And finally, thanks again to our master organizer Amy, SF Food Bloggers version 2.0 will be next Friday (thx Sam). It should be loads of fun. I am so looking forward to this! Sorry to have to follow up a happy post with a very sad one. I just found out today that Jacques Derrida passed away yesterday. Foucault's concept of power, Derrida's différance, and Harold Garfinkle's deviance are the three concepts that have made the biggest difference in my thinking life. Bruce Cole, over at Saute Wednesday, just published something hilarious. You just have to go check it out. It's called: That's it - No more 4 star dining for you! I snorted tea through my nose reading this. Thanks Paul for the pointer. WBW2: Spanish and Indian, not for the faint of heart! I just found out that today is Wine Blogging Wednesday 2 - well you know I've been sort of busy. This WBW is being hosted by my friend Alder at Vinography, so of course I had to participate. The only little problem is Wednesday is my usual Shalimar day. I have a few friends who are always at Shalimar on Wednesdays, and when I am in town I usually try to go. For those of you not in the know, Shalimar is my favorite Pakistani naan/curry house in the Bay Area. It's still not the Tayyab, mind you, but the best I could get when I am not in London. It's also a complete dive – in the Tenderloin no less – but the delicious dishes after dishes of curries, tandoori, and bread that stream out of the open kitchen make it worth the risk to live and limbs. 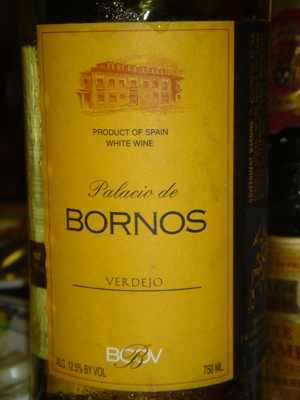 So, the challenge for this WBW2 is finding a Spanish wine with enough residual sugar and enough complexity to fend off the heavy spices in Shalimar's food. Making my life even more complicated is the fact that I am not that big a fan of Spanish wines, and don't even have one in the cellar. I've known about Kinja for a while, but have just recently started using it regularly. Kinja is a weblog portal that allows me to put together my own digest of blogs that I want to keep up with. My Kinja Digest is what I look at in the morning to see what's new on the various blogs I am interested in. I am definitely a Kinja devotee now. I still love Food Blog Central at Bourrez Votre Visage however, and do go there regularly. But when I am pressed for time, Kinja is where I go to read up on only the blogs I know and love. Discovering Kinja also rekindled my interest in Megnut, whom I knew long ago when she was still in San Francisco. Meg is a technologist and one of the founders of Blogger, whose influencial blog Megnut has been a fixture in the blogging scene for years, and has inspired many blogs that followed, including Chez Pim, in fact. Kinja is yet another one of her cool brain children. Revisiting Megnut revealed another fun transformation. It turned out that she has decided to change profession, from geek to chef! She is spending six months in the kitchen at a restaurant called Fifty-Six Union in Nantucket, and is blogging about her experience. How fun is this? Very gutsy Meg, and the best of luck to your new adventure! So, a cheese service at Otto a few months back reminded me of the truffle-infused honey I loved. I thought to myself that this wasn't all that hard to do, all I needed was a decent truffle and good honey. When I was in Paris this last time I made it to the bio market on Sunday, and bought some fabulous honey from my favorite honey man in the world, Jean-Paul Couto. His honey is raw and completely unfiltered, and tastes like the forest and the trees from whence it came. 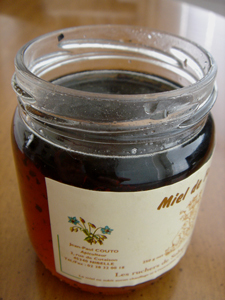 I bought some amazingly fragrant Miel de Tilleul (linden), pungent Miel de Châtaignier (chestnut), and strong Miel de Forêt (forest). Then went to Le Grand Epicerie to get some truffles - yes, yes off the season I know - but I really wanted to try. So, fast forward a couple weeks, now I was back home in SF. I finally had the time to continue with my experiment. So, the chopped up truffles went into the fabulous forest honey, stir, stir, stir, and what did I get? A perfectly good honey spoiled by icky looking black bits that tasted like nothing. Mind you I deserved all of this! I should have known better. I really should have. I should have known not to buy the stupid preserved truffles in the first place, especially at 40 euro a pop. Then I should have known that the truffles that smelled of nothing while I was chopping them up would smell even more so like nothing in my fragrant honey. I shall now go stand in the corner and repeat "I should have known better" twenty times. My foray into haute cuisine a couple of weeks ago in Paris produced a big hit and a miss. The hit was at the relatively new star on the horizon, Le Meurice, with the talented and seriously cute chef Yannick Alléno at the helm. The miss was at one of my favorite restaurants in the world, yes, L'Arpège. How very sad? Well, I'm not quite in the mood to talk about the disappointment at L'Arpège yet, so shall we start with the delightful new discovery, Le Meurice? I've been saying for a while now that the two most exciting places to eat when it comes to haute cuisine in Paris are Les Ambassadeurs at the Crillon and Le Meurice at the hotel Meurice. I have not given up on my old favorites, L'Arpège, Pierre Gagnaire, and L'Ambroisie, not at all, but it would take a lot of convincing for me to go to the other old guards like La Tour d'Argent, Taillevent, or other gastronomique restaurants from where one could, as dear Mr.Finch put it, smell laurels being sit upon from miles away. The reason I picked these two young-ish chefs as most exciting to watch was clearly because of their pedigree and perceptible drive to succeed. Jean-François Piège, the chef at Les Ambassadeurs, came from the top spot chez Alain Ducasse, and is now poised to continue to make huge waves on his own. The other one, the slighter older – yes and way cuter – Yannick Alléno, caused a sensation when he received the very generous, and unprecedented, two Michelin stars after having arrived at the stove at Le Meurice only six months prior. I had a nice lunch at Les Ambassadeurs a few months back – for which the jury is still out for me, sort of – and plan to wait until I go back for dinner before I really make up my mind. 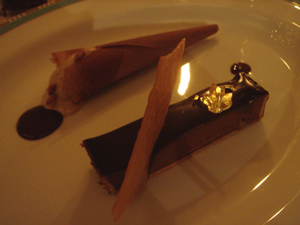 As for Le Meurice, I finally managed to have dinner there the last time I was in Paris just before my birthday.